Rapid, balanced, precise and flexible enough to fit any pit, AC Hydraulic’s advanced jacking systems offer you more flexibility for accessing different lifting points on vehicles, enabling your technicians to jack in the centre of the pit if required. A single jacking beam can service any length pit, doing away with the need to install multiple jacks. Technicians only need to push one carriage up and down the pit instead of positioning two jacks (one on each side). 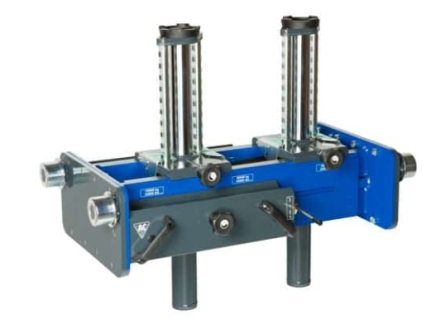 Unlike other jacking systems that often don’t lift evenly, AC Hydraulics’ twin ram pit jacks use two individually controlled rams to provide safe, balanced lifting. Quality made in Denmark, their air/hydraulic operation means there are minimal moving parts and no hydraulic lines or electrical cables needed in the pit – reducing the potential for trip hazards and improving workshop safety for your technicians. If required, the jacking beam can be removed from the service pit in just minutes. Plus the jacking beams boast very low service costs of around $130 per annum. Levanta also stock the full range of adapters and saddles to perform every jacking task safely. We have been successfully retrofitting these jacking beams on concrete and prefab pits for 10 years. We believe it’s the most advanced pit jacking system available in Australia. Is your jacking system engineered and compliant? Does your jacking system have a safety locking device? Is it made in Europe to exacting standards? Is your jack air operated, to eliminate trip hazards from hydraulic lines in the pit? What are your service costs per year per jack?